Product prices and availability are accurate as of 2019-04-09 00:33:06 EDT and are subject to change. Any price and availability information displayed on http://www.amazon.com/ at the time of purchase will apply to the purchase of this product. As networking technology continues to evolve, the needs for a wired network continue to expand, be it in the home or office. A home user may find his existing Ethernet or Wi-Fi wireless network inadequate for transferring movies and home video files to his notebook PC. The office environment may be dealing with new, large varieties of software files that strain their existing Fast Ethernet connections, causing monotonous delays. The NETGEAR GA511 Gigabit PC Card allows any network to be supercharged with gigabit speeds when used with a Gigabit Ethernet switch. Experience speeds up to 10 times faster than Fast Ethernet and 100 times faster than 802.11b wireless. Take your network experience to the next level with an upgrade to Gigabit Ethernet via the GA511. Gigabit speeds for fast data transfers. An auto-sensing port that eliminates manual switches. NETGEAR's Smart Wizard for painless installation. 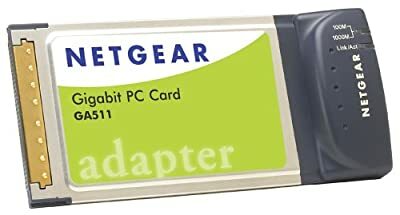 The NETGEAR GA511 Gigabit Ethernet PC Card provides your computer with fast 1000 Mbps performance that is up to ten times faster than Fast Ethernet and 100 times faster than 802.11b wireless. At Gigabit speeds, even large video files are transferred quickly. View larger. Installing the GA511 requires insertion into an open 32-bit CardBus slot and installation of the included software. NETGEAR's Smart Wizard Install Assistant has you up and running in fewer than five mouse clicks. Included in the software is the Performance Dashboard that monitors the actual speed. At 1000 Mbps, even large video, CAD, and database files can be transferred over the network quickly. In addition to 1000 Mbps systems, the adapter will also work with 10 and 100 Mbps systems; since the port is autosensing, there is no need for manual switching. The adapter is compatible with 10 Mbps 10BASE-T, 20 Mbps full-duplex 10BASE-T, 100 Mbps 100BASE-TX, 200 Mbps full-duplex 100BASE-TX, and 1000BASE-T Gigabit Ethernet. The NETGEAR GA511 Gigabit Ethernet PC Card is backed by a 1-year warranty.